The editors have been on my track the last week or so to write the foreword for yet another issue of the School Magazine; these annual requests seem, to me, to arrive at progressively shorter intervals of time a reminder that the older one gets the quicker time flies. You will learn from the contents:of this issue of the Magazine all about the various activities of the School during the past year, so I shall not attempt to go into. details. On the whole, I think we can claim to have had quite a satisfactory year - in our studies, games and the extra-school activities. True we did not pull off the Guiana Scholarship last'year, but we must not be too greedy, must we? Anyway, we must see what we can do about it this year. The whole School - especially the. members of Austin House — is regretting the departure of Mr:Bevis, who, after twenty one years service at Queen's College, has received well-earned promotion to Northern Rhodesia. We shall remember him, and his good works for many a long day. May he have a similar measure of success in his new post! Good reading in the Magazine - and good luck to everyone in the coming public examinations! For tne hundred years and more since its foundation Queen's College has played an important part in helping to shape the destiny of British Guyana. During this period Queen's has grown along with the Colony as the country s population has increased so has the number of students at the College increased. To cope with this expanding roll, the College was removed from one building to another - always to a larger and more convenient one - until it arrived at the present premises, whence it will soon be removed to the fine building now being erected in Longden Park. The entire community is influenced directly or indirectly by the College and its long standing reputation is respected by all. Queen's Colleqe stands for the very best in education. To on occasional student the College may mean the place where he plays cricket, football hockey tennis and many games of his liking in his recreational hours- but to the parent it means the place where he may secure for his son a sound and wide education for life in general. The public expect every pupil from Queens to display the qualities of a good citizen, a broad outlook a well-informed mind, honesty, energy, a belief in the future of his country and a willingness to work for its advancement. To helping to produce these the masters devote much of their time. When any student completes his courses at at Queen's and sets out on the voyage of life he should be a credit to his school and to his country. Wherever he goes he should carry with him that spirit of leadership which was developed in him during his school days. It is here at College that many of the leaders of the Colony first had their training. From among the ranks of boys who formerly attended Queen's are drawn a great proportion .of members of the Legislative and Executive Councils. On these men depends the welfare of the Colony ; and they draw on the ideals inculcated in them during their youthful days at College to help them in the wise and progressive government of British Guiana. The masters strive to instil into the boys an interest in world affairs and more especially in the affairs of their own country. When they leave schiool as young men they are prepared to take a responsible and active part in the life of the community. Those who are politically minded look forward to seats in the Legislative Council some day; and, having the improvement of their country at heart, whenever they are successful at elections, they fight spiritedly throughout their term of office for the welfare of the Colony and its people. In all they do they endeavour to keep up to the high standard of usefulness bred in them at College. Queen's Collge can claim among her old boys a high proportion of the professional men, both inside and outside the civil service of the Colony. 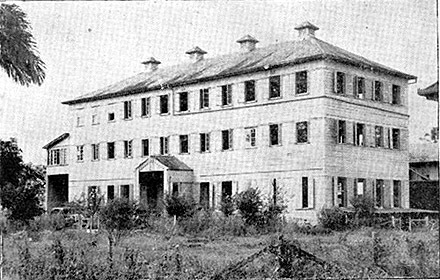 Very many doctors, lawyers, accountants, and men who perform equally valuable services to British Guiana, had their initial training at the College. In later life they look back on their days spent at Queen's with gratitude not so much for the book-learning received as for the spirit of good citizenship nurtured there. No less important in the life of the community are the technicians, engineers, scientists, many of whom attended Queen's during their youth. Men like these, who will have a great part in the development of the Colony, were taught at school to attain a wide outlook on life, to encounter difficulties and obstacles with a determination to surmount them, and to face failures and disappointments calmly and smilingly. This guidance for living well given by the College to all her sons is an integral part of their education; and, when they launch out into life, consciously or unconsciously they take it with them. In all the talk of Caribbean Federation which is going on now, the boys, especially the seniors of Queen's College, ought to take a keen interest. They should learn to think clearly and rationally and attempt to understand the points-of-view of the people in the neighbouring islands. It is on their shoulders that the future government of the Colony will rest; and, whether British Guiana is still a separate colony or is a member of a federation, the knowledge and ability of far-seeing, fearless men will be required to lead her to the prosperity which is her due. At this period when the University College of the West Indies is fast becoming a reality, Queen's College will naturally have a more important part in the educational affairs of the Colony. The University, will for a few years probably cater largely fpr students who have attained Matriculation standard, but the time will come fairly rapidly when only those who have gained higher qualifications will be accepted. In preparing British Guianese students for this University, Queen's will have to take the leading role. Not only for the classical side will she lay the foundations but also on the science side, for Queen's is, at this time, one of the two schools which are in any way qualified to teach Science, it will be the duty of Queen's to provide the basic scientific training of any student who desires to pursue the study of Science at the University.
. ' The future holds rosy promises for the development and progress of British Guiana. It is for the men who are to lead her to take full advantage of all the opportunities which arise. Many of these leaders will have passed through Queen's College, and the College is doing her best to ensure that they ore worthy of the responsibilities that will be theirs. Masters: Messrs. A.G.A. LARTHE, B.A. (Hons. ); D. A. SMITH, M.A. (Hons.). S R ALLSOPP, B.A. (Hons. ); K. N. MAUDSLEY, B.A. ; G. R. RAWLINGS, B.Sc. Junior Masters:Messrs. J. J. NILES.. B.A. ; CHUNILALL, B.A. ; C. I. DRAYTON; J. N. CHUNG; C. E. BARKER, C. A. YANSEN. Acting Junior Masters: Messrs. H. R. PERSAUD, B.A. ; A. P. B. RICHMOND, B.A. ; T. B. E. RICHMOND; W. H. SMITH; E. L. ARCHER. Preparatory Form Mistress: Miss L. DOLPHIN, L.R.A.M. Laboratory Assistant: Mr. D. A. L. CARRINGTON. Head Prefect and Capt. of School: J. W. WHITTINGHAM. AUSTIN HOUSE "C": J. W. WHITTINGHAM (Capt. ), B. EYRE; K. EYRE; I. LAM, F. I. LOW-A-CHEE. PILGRIM HOUSE -E": K. M. W. TANG (Capt. ), N. S. C. CAMERON, B.A.N. COLLINS, C. A. W. DEANE, H. I. LEAL; N. 0. LINTON. WESTON HOUSE "F": D. G. SMALL (Capt. ), C. A. 0. SYLVESTER, B. W. VIGILANCE. Capt. of Cricket H. I. Leal. Vice-Capt. of Cricket R. A. Gibbons. Vice-Capt. of Football W. I. Lee. Capt. of Hockey K. M. W. Tang. Vice-Capt. of Hockey M. Glasford. Capt. of Athletics J. W. Whittingham. Judge: Mr. D. A. Smith. Editors; B. A. Eyre, L. H. Thorn. Committee: W. W. Anderson, N. S. C. Camoron, N. O. Linton, M. S. Ragbeer. Back Row: (L to R) M.T. Lowe, K.S. Eyre, B.A. Eyre, N.O. Linton, C.A.O. Sylvester. Middle Row: (L to R) F.I. Low-A-Chee, N.S.C. Cameron, L.E. Ramsahoye, L.H. Thom, I.R. Lam, B.W. Vigilance, C.A.W. Deane . Front Row: (L to R) D.G. Small, J.D. Adamson, J.W. Whittingham (Capt. ), Capt. H. Nobbs (Princ. ), K.M.W. Tang (Vice-Capt. ), B.A.N. Collins, W.W. Anderson. Absent: H.I. Leal, M.S. Luckhoo . CARRINGTON, D. A. L. (1939-48): School Certificate, 1945- School Prefect, 1947; Captain of Weston House, 1947; Vice-Captain of the School, Jan., 1948. CHABROL, C.S. (1939-48): schooi Certificate, 1945; School Certificate 1946 (Exemption from London Matriculation); Queen's College Senior Scholar, Jan., 1947; London Higher School Certificate, 1948- School Prefect, Sept., 1948; Captain of Raleigh House, Sept., 1948. 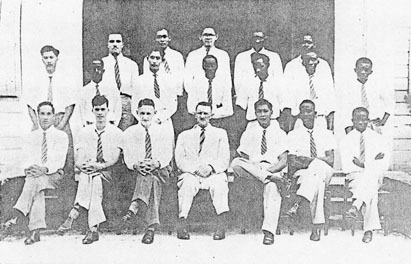 EDWARDS, R- L, (1941-48): Government County Scholar, 1941; School Certificate 1946 (Exemption from London Matriculation); School Prefect, 1947; Captain of Durban House, 1947; London Higher School Certificate, 1948 (Exemption from Inter-B.A.). FORBES, G. P. A. (1943-48): School Certificate, 1945; School Prefect 1946; London Higher School Certificate, 1948, with distinction in Chemistry (Exemption from Inter-B.Sc. and First Merical) placed third in order of merit for B.G. Scholarship, 1948. JACKSON, R. E. (1940-48): Government County Scholar, 1940- Government Junior Scholar, 1944; School Certificate, 1945 (Exemption from London Matriculation); School Prefect, 1946; London Higher School Certificate, 1947 (Exemption from Inter-B.A. ); London Higher School Certificate (as candidate for B.G. Scholarship) with. distinction in Pure maths. JONAS, R. M. (1940-48): Government County Scholar, 1940; Cambridge Junior Certificate, 1943; School Certificate, 1945 (Exemption from London Matriculation); School Prefect, Feb., 1947; London Higher Certiflcate 1947 (Exemption from Inter-B.A. ); Vice-Captain of Cricket 1948; Captain of Pilgrim House; Candidate for B.G. Scholarship, 1948. KING, I.R. (1939-48): Captain of Raleigh House, 1947; Cricket and Football Colours; Captain of Athletics, 1947; Under 13, Under 17, Open Athletic Champion; Athletic Colours. KING, K.F.S. (1941-48):Centenary Exhibitioner , 1941; School Certificate, 1946 (Exemption from London Matriculation); School Prefect and President, Debating Society, 1947; London Higher School Certificate, 1948 (Exemption from Inter-B.A. ); Editor of Magazine. NOEL, F.A. (1940-48):Government County Scholar, 1940; Cambridge Junior Certificate, 1943; School Certificate, 1945 (Exemption from London Matriculation); London Higher School Certificate, 1947 Exemption from Inter-B.A. ); School Prefect, 1947; London Higher, 1945 (as candidate for B.G. Scholarship). PAIRAUDEAU, B. H. (1941-48): Moulder Cup for Junior Cricket, 1944; and 1945; Queen's College Junior Prize, 1945; Cricket Colours, 1946; School Certificate, 1948; holds record individual score of 216 not out made by a Q.C. batsman in Second Class Cricket, (also a record for any class of Cricket for Q.C. ); is the first Q.C. boy to have scored a century (130) in an Intercolonial match (vs. Jamaica, 1947); holds the distinction of being the youngest player to represent British Guiana in Intercolonial Cricket (at the age of 15). PANDAY. D. C. (1943-1948): Berbice High School Scholar, 1943; London Higher School Certificate, 1945; British Guiana Scholar, 1946 (distinctions in Modern History and Geography); Awarded a Free Place at Queen's College, Jan., 1947; School Prefect, Feb., 1947; First Medical Examination, 1948. RAI, L. L. (1940-48): Government County Scholar, 1940; Government Jcmior Scholar, 1944; School Certificate, 1945 (Exemption from London Matriculation); School Prefect, 1946; London Higher School Certificate, 1947 (Exemption from Inter-B.A. ); London Higher School Certificate, 1948 (as candidate for B.G. Scholarship). SAM, D. (1941-48): Government County Scholar, 1941; School Certificate, 1946 (Exemption from London Matriculation); Capt. of Table Tennis; London Higher School Certificate, 1948 (Exemption from Inter-B.A. ); School Prefect. Annamunthodo, R.; Bhagwandin, H. 0. (School Certificate); Boland, R. F. V.; Cameron, M. A. (Q.C. Exhibitioner, School Cert., Matric., School Prefect); Carter, B. W. (School Cert., Matric.,); Chan, L. C. (School Certificate); Cheong, H. W. (School Certificate); Cheong, N. A. (School Cert. ); Da Silva, R. N. A. (Centenary Exhibitioner, School Certificate, School Prefect); Delph, J. B.; De Broglio, M. M. C. (School Cert., Matric., Q.C. Senior Scholar); Dumont, D (School Cert.,) Edghill, W. D. F. (Govt. County Scholar, School Cert. ); Field, R. D. (School Cert. ); Fraser, M. A. (School Cert., School Prefect); Fung-a-ling, W. A. (School'Cert., School Prefect); Gilkes, G. A. W. (School Cert. ); Gordyk, S.; Gullin, G. L. (School Cert. ); Hahnfield, M. U. C. (Govt. County Scholar); Harewood, C. A. (School Cert. ); Kaufmann, R. D. (School Cert. ); Lall, R. M. (Q.C. Exhibitioner, School Cert., Matric., School Prefect, London Higher); Lee, B. E. (School Cert., Matric., London Higher Cert. ); Lee, E. L. (School Cert. ); Lee, T. F. K. (Q.C. Jun. Exh., Q.C. Jun. Sch., School Cert., Matric., School Prefect); Lilley, D. W.; Man, M. 0. (School Cert. ); Mathews, D. D.; October, W. A. M. (School Cert., Matric. ); Owen, W. E. (School Cert. ); Phang, C. D.; Skeete, N. F. (Govt. County Scholar, School Cert., Matric, School Prefect); Tattrie, J. I.; Tong, T. S. (School Cert. ); Too Chung, T. M. (Q.C. Jun., Exh., Q.C. Middle Sch., Exh., School Cert. ); Verrier, W. L. (School Cert. ); Yankana, D. I. (Govt. County Scholar, School Cert Matric); Zorn, R. E.
Elder, J. C. (School Cert., Matric. ); Melville, L. B. (School Cen. ); Phillips, C. B. (Q.C. Middle School Scholar, School Cert. ); Whitehead, G D. (School Cert. ); Wood. G. C.; Roman, I. N. (School Cert. ); Rahaman, M. S. K.
Allen, L. R.; Archer, W. E.; Bacchus, D. W.; Benjamin, G. U. McD. ; Bobb; E. .0.; Brewster, E. E. C. R.; Chan, R. M.; Cheong, 0. M.; Chinapen, B. S.; Coltress, C. D.; Cossou, N. F. M.; Cummings, S. C.; Ferdinand, J. J.; Frankiss, C. C.; Frankiss, S. G.; Fraser, R. A.; Galbraith, A. D.; Galbraith, J. B.; Gray, J. M.; Gurudata; Ho-a-vun, J. E. F.; Holder, J. E.; Humphrey, R. A.; Khan, M. M.; Khan, M. Z.;Lee, S. V.; Lee-Ting, C. E.; Leila, L. M.; McAllister, H. A.; McAndrew, W. A.; McDoom, M. M.; Mangal, K.; Mass, J.; Matthews, M. E.; Miller, M. E.; Murray, J. P. A.; Nicholson, J. A.; Nizam, M.; Odle, M. A.; Parmaswardat; Permaul, J. A.; Pinkerton, T. A.; Ramphal, P. J.; Ramsahoye, J. W.; Ridley, M. S.; Robinson, L. A. R.; Rodway, N. A.; Sahai, A. A.; Sampson, G. A.; Samuels, E. R.; Singh, D. D.; Spence, A. R.; St. Pierre, M. A.; Stafford, S. F. van B.; Tang, A.R. ; Tang, E. M. W.; Tang, M. 0. S.; Terrill, A. A.; Ting-a-kee, V. E. R.; Welch, I. A.; Wharton, I. H.; Wilkinson, C. W.; Woo Ming, G. E.: Worrell, J. S M; Yhap, M. V.; Ying, I. A.; Edwards. J. C.
This article does not deal with reminiscences, but lays the stage for such a series of articles in the future. Below are a few remarks on the old School — Buildings, Staff and Boys — as found by the writer when he joined the school. Alas, the day — All Fools' Day, 1905. 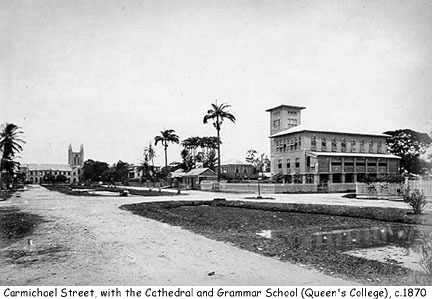 In 1905, Queen's College was housed at the corner of Carmichael and Murray Streets, where the Bishops' High School for Girls now stands. The main entrance, through which boys were not allowed, was in Carmichael Street, and there was a side entrance in Murray Street. There was an imposing tower, to the front, from which a good view of tlic city could be obtained. The stairs and the aisles between rows of desks were covered with fibre matting strips to deaden the many noises of a boys' school. The Principal's study was at the back on the top floor towards Murray Street. In it were the same rocking chairs now used today, the same washstand and mug. The clocks of. today, the slate black-boards came across from the 1905 building. Then there was Samuel Webb, the janitor, with top hat and frock coat and long beard, always spick and span. He talked with hushed voice as if the place was holy. He was a part of Queen's College, and was proud of his job. There was nothing frivolous in anything he did, down to the ringing of the bell, the opening of the doors. He was always bemoaning the good old days of Principals Percival and Potbury. In 1905 the Principal was T. A. Pope, who had a terrible squint, forcing him to cover one of his eyes with his hand, so that one could tell if he were looking at you or your neighbour. He had a wonderful vocabulary of names for the boys:— toads, East-coast crab-dogs, baboon, gorillas, slippery lizards, monkeys, chimpanzees, etc. This vocabulary he could use with effect. Underneath was a heart of gold. The Second Master was G. F. Franks, classics. He was known as the 'grand old man'. He was the model of the perfect gentleman. Dressed in grey tweeds, trousers, waistcoat and jacket, and a panama hat, he stepped out of his cab, at the ringing of the bell each day, throwing away as he did so his cigarette, as no smoking was allowed during school .hours. J. Hunte, was Third Master and taught the French of the Lower School. In his teens he lost one of his lungs, causing him to walk with a list, one shoulder higher than the other. He knew the whole of Henri Bue's French books by heart and has taken a class without a book. He was slightly pro-German in the first World War, and the boys would always be singing just loud enough for him 'not' to hear 'Johnny, get your .gun, get your gun'. Said Mr. Hunte, 'I can't understand why the boys call me Johnny, my name is Johnathan'. The Fourth Master in 1905 was E. R. D. Moulder, an old boy who had won the Guiana Scholarship, and had taught at Lodge School, Barbados, and the writer was one of his pupils at that School. He was an excellent cricketer, and played for the colony on many occasions. To all, both as a boy and master he was known as 'Sheepie'. In 1904, an experiment was made of bringing across a teacher from the elementary schools to improve the Arithmetic of Queen's College, and in 1905 Mr. P. McFarlane held this position. "Peter Lam-Lam' as he was called by teh boys never got used to the loss of the authority he had as a head teacher outside. Last, was Mr. English, a part-time Chemistry Master, loaned to us by the Agriculture Department. Along with the writer, the staff therefore was composed of seven and the number of boys was 140 odd. In 1905 there were 141 boys at school, and since that date to the present 2,332 have joined the school so that directly or indirectly the writer has had to deal with 2,473 boys. Reading the names of boys at Queen's in 1905 is very entertaining. No attempt is being made to recall boys who entered after 1905. Dealing with brothers first of all. The Dyers, Jonas, Phillip and Warwick; Vanzers, Abraham and Albert Egbert Percival, the former a leading Solicitor of today ,and the latter became a Guiana Scholar and is now dead; The Pereiras, Norbert and Jose, soils of the late J. N. Pereira; they came to school in a buggy; Sharpies, John Bradshaw and Lorris Rhoan, both prominent in the local civil service, the latter as a doctor; Ewing-Chows, Solomon and Jerimiah, the latter is now dead, he was a Government Medical Officer in the Colony; The Gouldings, Lloyd Dorset and Ernest Victor Dorset, both prominent Customs Officers; Lords, Cyril Haverton and L. Neilson, the former recently retired as Acting Director of the Transport and Harbours Department, -and the latter a Director of G. N. Lord and Co., Ltd.; James, Henry Ng-A-Ow and Charles Ng-A-Ow; The Khans, Budruddin and Azez-ud-din, sons of the Mahomedan priest and noted for their good looks; The Cyrils or Ng-Fooks. Frederick and Simon Peter; The Fairbairns, George and Herbert, sons of the Town Clerk; The Grants, Maurice and Herbert. Then there were:—Frederick J. Hopkinson, of the G.P.O. and famous Chess Champion; Hubert N. Chapman-Edwards, of Sandbach Parker and Co., Ltd., and organist of Christ Church; J. P. Barlow of Mahaicony and Booker Bros., Ltd.; Lionel Stuart Davis, son of the late John Wood Davis, and now Government Chemist in Trinidad; Eugene Allan Brown, son of the late Hon. A. B. Brown; C. V. Hunter, Director of Garnett and Co., Ltd., and Colony cricketer; George Forshaw Messervy, now of the Control Board; Frederick J. J. July, now of New Amsterdam; Charles W. H. Collier, of the C.S.O. ; Carl Uchlein, late of the Income Tax; C. H. Parsley, of the P.W.D. ; Gerrard Dragten; Hugh A. Barclay, a prominent planter; Thomas Boucher Reid, late of the P.W.D. and the well-known sports-promoter; George McDonald, retired planter; R. G. Chalmers, late of the Customs; Percy B. Green; Charles Henry L. Schuler; John Aloysius Veeraswamy, retired Magistrate and famous Colony bowler; Henry Cendrecourt; Philip Henry N. Saunders; E. D. Wellesley Reece, Guiana Scholar and Government Medical Officer; Justin Cleland LaTrobe Potter, late of the staff of Queen's College; Joseph Archibald Reis; Wendell Lushington Bruce-James, well-known pianist; William Inniss Brenner; Antonio Ricardo Gomes, or "Tony" as everybody calls him, Accountant of the Georgetown Town Council; Kenneth Reid; late of the staff of Queen's College and the Agriculture Department; . Arthur Benfield Dargan, son of the late Patrick Dargan, famous barrister. Of the boys who entered Queen's subsequent to 1905 more hereafter. (under construction at Longden Park). Rome was not built in a day. No doubt many a Roman "puer" attained to the toga virilis' while the stately Temple to Mars was slowly growing to magnificence in the Forum. Many of us will be Old Boys by the time the new Queen's College building in process of construction at Longden Park is completed. That is our misfortune; but youngsters now in the Senior School will be taught in one of the finest buildings in these parts. It is now about to enter its second year of construction. Progress to date? "Satisfactory", say both its designer and the resident engineer in charge of construction. Leary Parade Ground For they had laboured for years and years to get the powers-that-be to admit the necessity of a new building, consider the means of getting one, set aside the funds required, and after the frustration of war, get the project started. Sighs of 'At long last', were breathed when detailed plans and scale models were made and displayed, and when workmen by the truck-load went to work on the foundations. Everything promised well as pillar after pillar of reinforced concrete arose and the hum of activity grew. Then all of a sudden the public realised that construction had slowed down almost to complete cessation. Local timber companies, loth to meet Government's high-quality specification, preferred to export to avid markets abroad, with the result that, despite "high priority", deliveries of timber for Government projects were behind schedule. Furthermore, the decontrolling of nails locally caused a new splurge of house building. The new QC. began to wear a neglected look. The long rows of ferro-concrete pillars came to be referred to as "stonehenge". As piblic realisation of this state of affairs grew, comments appeared in the local Press bringing into general light the understaffin of the College, the consequently limited nature of the Sixth Form, and the necessity for drastic steps as regards 22 boys in the Fifth Forms. the resulting furore was not without good effect on the progress of the new building. In certain official quarters pressure was brought to bear on ceitain of the timber companies, and this coincided with an improvement of the import situation as regards certain necessary items. (For example, 50 tons of steel arrived before the end of last year). Again there was activity at Longden Park. To many old boys, hardened by repeated frustrations, the interruption merely marked another milestone in the progress of the College. But many juniors were dejected at the time. Work was started on the Principal's residence and an attractive bungalow resulted on the south-west corner of the site. Designed by Mr. W. Heard, who also planned the main building, the bungalow has all the distinctive features of modern designing. In many respects, a model building, it is a foretaste, so to speak, of the advanced style of the main building. A view of the Principal's Bungalow. light derricks having been used to lift the 1 ton trusses bodily into place. Roofing material is expected shortly from the United Kingdom and the next stage, boarding up, will commence shortly. In the western classroom wing, framing is making rapid progress. The library and art-room block 63 ft- x 27 ft, facing Camp Road, are already framed complete and will be ready for use for lectures, examinations and so on by the middle of next year. Construction closely follows the main lines of the plans made three yaers ago. Most of teh "quirks" connected with building such a giant structure have been anticipated and can be "ironed out", many valuable lesssons having been learned from the construction of the B.H.S. building. Exact figures of such matters as lotal cost cannot be finally calculated at this p;oint but despite the 8% increase in the labour bill this year and other such eventualities , many already forseen, the cost is not expected to exceed greatly the first estimate of $400,000. The exact date of completion is also difficult to Predict. Mr. F. H. Alien, Resident Engineer-in-Charge of construction, points out that labour could always be found to step up construction, but not timber or other high-grade material. As regards timber, Mr. Allen observes: "Though some timber mills have done well in meeting obligations, a considerable augmentation of the present rate of supply is still necessary". What effect the rival construction of other government buildings will have on the new Queen's College cannot yet oe assessed. Work on the new General Post Office will start soon. Overseas orders have long been placed for everything necessary. For jxample, 11,000 sq. feet of glass will be coming from U.K exporters. For this glass 2,000 window frames are required in addition to doors and jalousies. These are not imported but manufactured on the spot in one of the huts in the compound. (There is little outside sub-contracting). This hut, a miniature factory, is a self-contained wood-and-iron-working mill. It turns out 15 windows daily, each 32 ins. square, by mass production methods. The tools thus used, the younger boys will be happy to know, will go into the school workshop when the College is completed. They include a portable circular saw, planing machine, morticing machine, a double saw, tenon machine, electric drills, and grinding and sandmg machines. Laboratory equipment has already been ordered . Well, that is the general outlook — much better than before, we can confidently assert. There are 100 men at work and the number will be increased whenever circumstances warrant it. To the south, Casuarina trees are springing up. To the North, preparations are about to be made for the construction of the drive-way and teh great Main Entrance Hall. Work all around is bowling along at a right good pace. Have we left all setbacks and disappointments behind? Here we must cross our fingers. But let us not in our impatience, minimise the magnificent work that is being done up there. The new Queen's College will be well worth waiting for.